United Methodist congregations across the East Ohio Conference are doing their part to fight illiteracy. A driving force behind the development of such ministry is the reality that if people struggle to read, how will they ever read and understand God’s word? Welcome to Camp Read-A-Lot, now in its second year at Faith United Methodist Church (Tuscarawas District) in North Canton. The program is led by teachers and trained literacy volunteers and is offered at no cost to participants. 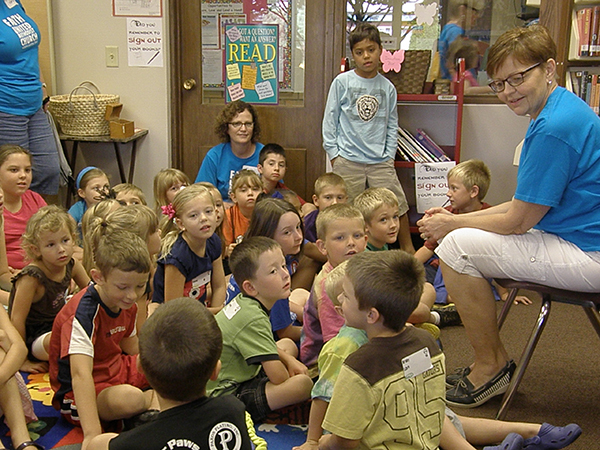 Students entering kindergarten through third grade gathered at the church on Thursday mornings in July for fun activities designed to build their vocabularies and expand their comprehension while keeping their reading skills sharp. The children read stories, played games that involved sight words and phonics, made art projects and took part in service projects. It’s not just the kids who can’t stop talking about Camp Read-A-Lot, the parents are the same way. “We love it. It’s a great program and we are happy that there is a faith base to it,” Soliday said. Tiffany Riedinger is a repeat customer too. This year she brought her seven-year-old and four-year-old children and her niece and nephew. Parents were informed of Camp Read-A-Lot through flyers that were sent home at the end of last school year with elementary students in the North Canton City School system. “Some of the teachers in the schools have commented on the program and how much the children enjoy it and talk about it when they get back to school,” Laura Luikart said. “We have children from all over the community. Some from different religions and backgrounds, some from other churches and some with no church background. It’s been a good outreach program,” said Paulette Baker, who like Luikart is a retired school teacher and a co-coordinator of the Camp Read-A-Lot ministry. The vast majority of the children at Camp Read-A-Lot – 90% according to Schmucker – are from outside the congregation. “It’s exceeded our expectations by far,” Baker said. The reason for and the popularity of this literacy ministry is spreading across the conference. This year Garrettsville United Methodist Church (Western Reserve District) offered Camp Read-A-Lot for the first time to the community, after visiting Faith UMC last year to study and learn the program. Multiple East Ohio churches had representatives observing the program this year at Faith, preparing to plant seeds of faith in a new way next year. For more information about the Faith UMC Camp Read-A-Lot program, click here. Praise God for the opportunity to share how God is at work through Faith’s Camp Read-A-Lot! Thanks be to God for everyone involved who made Camp Read-A-Lot such an amazing experience for everyone who participated!